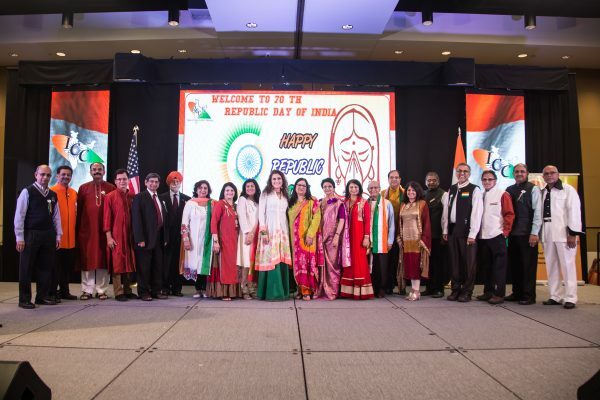 STAFFORD: Blessed with warm temperatures and sunny skies, a stream of people came through the Stafford Civic Centre all afternoon long, till the late evening to participate in the first large community-wide event of the year, India’s Republic Day celebration. One of its two flagship events, the India Culture Center once again held the celebration of the 70th Republic Day with a now familiar setup of booths and stage shows, making it cozy for the regulars who attend and easier on the vendors who go through their often practised paces. The organizers were likewise heartened by the turnout and especially that people lingered on till the end of the cultural programs which started after 5:30. “Success is sweet, but it’s sweeter when its achieved thorough co-ordination, cooperation, collaboration and teamwork,” said ICC President Nisha Mirani afterwards in thanking her Board and volunteers, and especially the 13 year-old Eesha Dhairyawan who assisted her throughout the day. The doors opened at 2pm and right after the initial welcome remarks dived into the Mom & Me talent contest organized by Jasmeeta Singh who has often pulled together such shows for the ICC programs. The entries were six teams of moms and their young children performing dances, songs, musical instruments and other routines; all much appreciated by the audience. Santosh Varma and Ajit Patel (he was dressed in a 70s style retro outfit) had organized an ICC Idol 2019 contest that projected many talented individuals and groups on stage. Other segments featured performers like the much-followed popular Mukhti Band of senior citizens who sat onstage and sang several songs while playing hand cymbals and other instruments. Charlie Patel, Pramod Bengani and Ajit Patel organized the over 36 booth of vendors lined up in the back of the hall and the front lobby area. Particularly impressive were the large stalls of Unique Arts, a framed pictures vendor, and Archie’s Creations, an artificial jewelry vendor, both of Atlanta, who had setup enormous booths of wares. Two food booths – Tony’s Kitchen and Hot Breads – provided ready-made food for sale. Dr. Raj Bhalla organized the Community Award Segment, which was held after the formal segment of the national anthems and speeches by ICC, community leaders and local elected officials including Stafford Mayor Leonard Scarcella, the Indian Deputy Consul General Surendra Adhana, Stafford Councilman Ken Mathew, recently elected officials Julie Mathew and Fort Bend County Judge K.P. George. Alice Chen, who is running for Stafford City Council Position 1 in the upcoming May 4 elections, made her rounds among the crowd. Also attending were the Fort Bend County Constable Pct 4 Trever Nehls and his twin brother Fort Bend County Sheriff Troy Nehls. Rajiv Bhavsar and Dr. Falguni Gandhi coordinated the VIP seating and the ICC booth was handled by Hemant Patel, Dr. Sarita Mehta and Swapan Dhariyawan. Darshak and Mona Thakkar of Krishna Sound provide the sound system, Raghu Thakkar of Image n Motions the photography and Asit Patel did additional photo and videography.